Category: H-alpha. 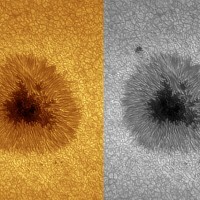 Tags: Accessory, Filters, H-alpha. 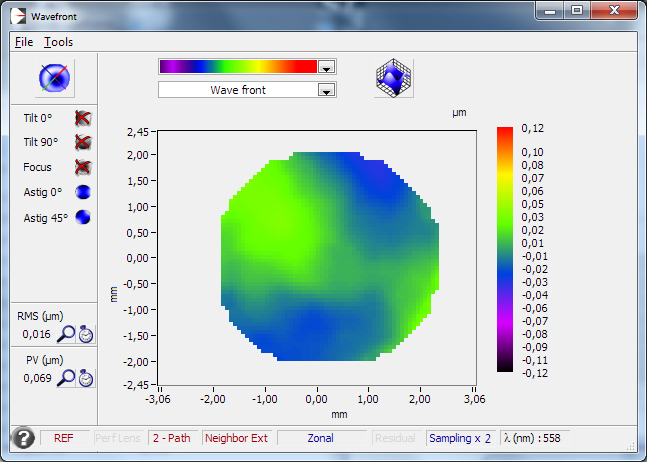 I have my D-ERF 160mm tested on the interferometric bench of AiryLab. Please note: Front-filter-cells for Baader-DERF-filters are only available together with the purchase of a SolarSpectrum H-alpha-System. 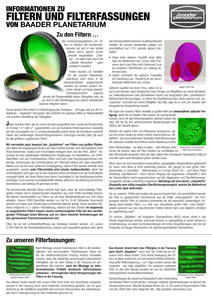 Using a SolarSpectrum filter (or any other etalon-based H-alpha filter) in conjunction with a „regular old-style“ ERF-filter, i.e. one not equipped with our proprietory IR-reflector coating, leaves the standard red ERF-filter wide open to the complete IR-spectrum. 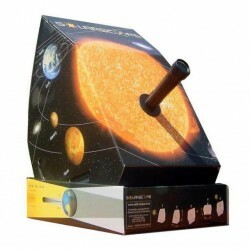 This can produce a substantial amount of heat at focus – cooking the etalon over the years. 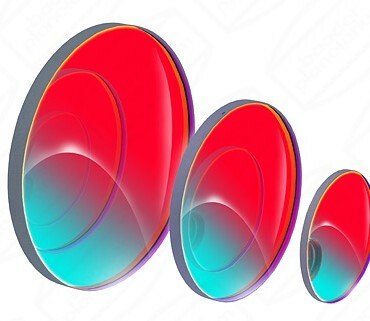 Our 43-layer dielectric DWDM-coating delivers a „COOL“-beam of pure red light, with a HBW of 45 nm! 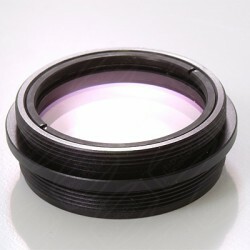 The glass substrate in this case is no longer any kind of soft and streaky colored absorption glass, but clear BK7 of the highest homogeneity, fine-optically polished to the quality grade of the objective-lens surfaces, and with all the reflection performance coatings on one side. This reflects all the unwanted spectrum from 280 nm up to 1500 nm, while leaving open just that 45nm-wide spectral window around H-alpha. It is hellishly difficult to design such a performance coating, as well as the counterside anti-reflection multicoating, in such a way that no coating-induced stress builds up inside the glass substrate. 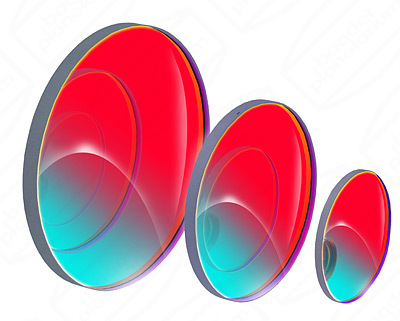 If these coatings systems on either side of the plate are not done exactly right, to cancel out the stresses induced by the coating layers, the plane-parallel surfaces may easily be distorted, meaning the 1/10 wave flat plate deforms into an irregular curved substrate that acts as a (bad) lens. 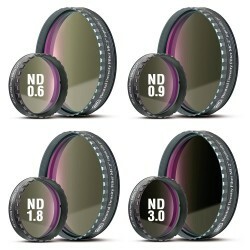 Our D-ERF filter-layers are designed with the utmost care, applied with the world‘s most advanced optical coating machines, and the final filters are all inspected and passed in autocollimation on our Carl Zeiss optical bench. This level of care retains the full-aperture resolving power of the telescope lens while dramatically reducing the thermal energy that goes through the telescope to the Solar Spectrum filter. This not only is the main reason for a dramatic reduction of heat stress within the telescope, but also greatly reduces the thermally-induced seeing effects as well. 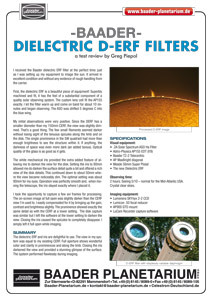 Old style ERF-RG-filters transmit all the energy in the IR, while just absorbing the energy in the visual below 610 nm – causing a heat plume in front of the telescope objective. The difference in heat buildup (measured at a distance of 4“ prior to focus) between a regular red-glass ERF-filter and our clear glass, hightech dielectric coated D-ERF-filter is about 70 °C. And, since all the unwanted light is not absorbed but reflected back into the sky, no heat builds up in front of the telescope aperture. The Solar Spectrum filter itself has a blocking filter built into the front window of the filter stack, which also performs as heat blocker. But, if the body of the unit is connected to the telescope the wrong way around, all the IR-energy will go right into the elaborate stack of polarisation filters and the etalon and – in the worst case scenario – may melt the polarizers or boil the immersion liquid inside a.s.f. orientation.Today we offer unmounted D-ERF-filters from stock in the most common sizes from 95 mm up to 180 mm in diameter. For some scientific projects we even made D-ERF-filters as large as 290mm in diameter – but the production difficulty and the resulting price is outrageous.